"The Onion," that five-minutes-before-bed hairstyle I told you about has gotten a lot of attention! "I did this last night and it worked! I've gotten compliments on my hair all day. I too have stick straight hair and hair that never holds curl. 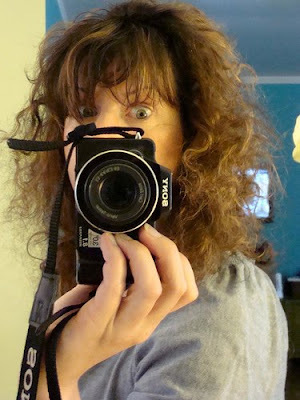 I did the four buns and while they were still a little damp this morning, I just took them down and dried them with a blow drier on low for a few seconds... My hair still looks good 14 hours afterwards!" "I tried this last night. Jumped in the shower, washed my hair, got out and did two buns on the side of my head. Nothing fancy--just wrapped my hair in a tight bun and put a hairband around it. Got up the next morning, put some mousse in my hair and went to work. I've been getting compliments all day long!" This photo is extra funny if you've met Kyran in person. Her hair always looks gorgeous and she's the epitome of style. The truth is, I feel sort of horrible about this hairtastrophe. I owe you a drink, Kyran! She writes about her brush with The Onion here.